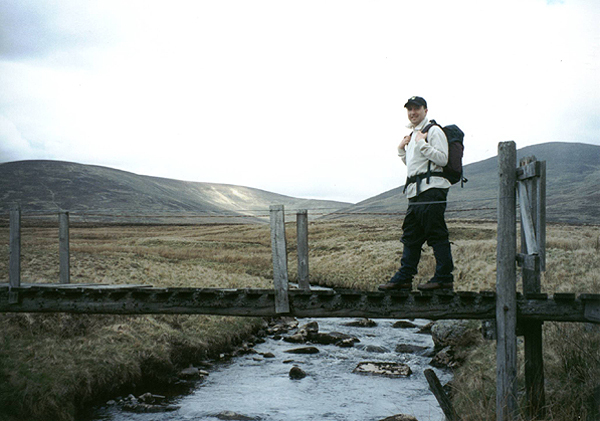 Duchray Hill Walk, Glen Isla, Glen Shee, Angus, Perth & Kinross. Duchray Hill - or Mealna Letter - sits between Glen Isla and Glen Shee and straddles the border of Angus and Perth & Kinross. It is a little climbed peak but one well worth doing as the summit is a fine viewpoint with vistas stretching west as far as Ben More. This route takes you from the summit cairn down to remote Loch Beanie and returns via a section of the Cateran Trail. From the layby, head east for a short distance along the B951. When the road emerges from the trees, turn left, leave the tarmac and head through a gate into an open field, often used for sheep grazing. Walk north from here, following the edge of the forest but take care in picking your route as the ground becomes increasingly marshy as you descend gradually into the lowest part of this wide but rather damp glen. It is worth bearing away from the fence a little at this point to find reasonably solid grass through the reeds. Aim for a gate at the bottom left hand corner of the field and go through. Underfoot, the terrain is boggy beyond this but soon dries out and becomes more solid as you begin the ascent. There is no path but stay with the edge of the forest. As you reach the ridge, the boundary between the forest and the open hillside bears right. Approaching this corner, you will come upon a new post and wire fence, running parallel with the old stone wall abutting the trees. Cross the fence and walk up between the wall and fence on to the top of Cairn Derig. 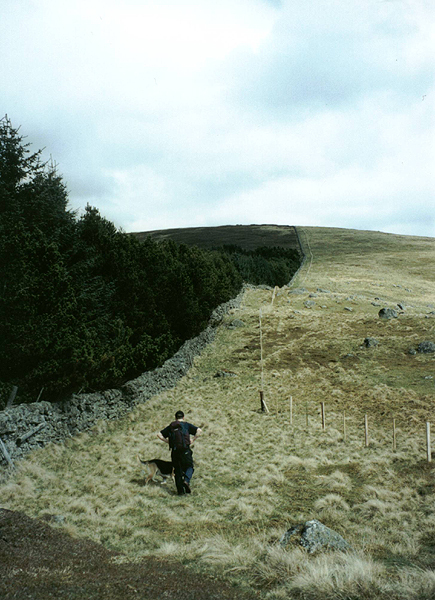 At the summit of this outlying top the 'passage' between the wall and wire reaches wooden fencing. Climb over, then bear left through a gap in the wall and continue north up an initially narrow corridor between the wall, now on your right, and the fence. This widens out further on. Continue straight up to the top of Duchray Hill. A large cairn sits over to the left of the actual high point. Head over to this and enjoy fine views north over Loch Beanie towards the scree-covered flank of Creag Leacach and, just beyond it, Glas Maol. To the north-west, the craggy coire below the summit of Glas Tulaichnean is obvious and, on a clear day, the twin peaks of Ben More and Stob Binnein can be seen, along with the Ben Lawers range, over to the west. 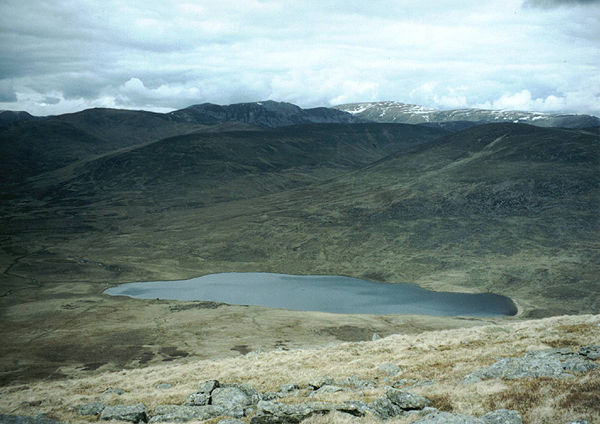 From the cairn, head north and descend over open hillside towards the western end of Loch Beanie. Pick up a path in the floor of the valley, go left and follow this west to reach a footbridge over the Allt Mor. Cross, climb up the embankment on the far side and head west on a generally pretty good path leading down to the steading at Invereddie. As you approach the farm, bear right, round the back of sheep pens, to join a track. Don't go into the farmyard but follow the track down towards the Shee Water. Before the river is reached, bear left at a junction where there is a stile and a waymarker for the Cateran Trail (a red heart logo). A muddy track leads up to a gate and stile. Cross the wooden ladder, bear right and walk round the top edge of open fields. In due course, the route descends to a footbridge over the Allt Mor. Cross, go left, and walk up to another stile. On the other side of this, turn right and follow a grassy track up through another grazing field. The route joins a stony track just short of a gate on the edge of Broughdearg farm. Don't go through this, but bear left and follow the track up to a gate and ladder stile in the wall at the top of the field (below an aerial mast). Cross the stile, turn right and follow the stone wall south-east for a mile or so until another Cateran Trail ladder stile is reached. Over this, a path leads down to join a farm track. Go left and follow the track through open fields. Further on, it bears right, skirting a copse of woodland to reach a gate. Once through, carry straight on through another field, heading towards a coniferous plantation at the far side. The way reaches the trees, then bears right, skirting along the edge of the woodland, down to the Shee Water. Here the track enters the trees at a stile on the left. It rises initially but soon flattens out to skirt above Dalnaglar Castle, emerging a mile or so on at the B951. Turn left and follow the road the short distance back to the start. Start/parking Small layby on the B951 at the boundary between Angus and Perth & Kinross, half a mile east of the hamlet of Cray. GR: NO 154643. There is space for a handful of cars. Grading The initial section of this route is over open hillside without paths. However, navigation is easy thanks to the presence of a wall and fence. The descent to Loch Beanie is over rough, open hillside. Short sections of the route can be marshy. A fair part of the walk is through sheep grazing land where dogs should be on the lead.